Happy Halloween! Have a safe, fun and a spook-tacular holiday. It appears SWTOR is in the spirit of the holiday fun with the return of the Rakghoul event and many items on the Cartel Market that seem to go along with the scary nature. BioWare was in a festive mood, as we got another SWTOR stream talking about changes in combat coming in Update 3.0. It will be some time before we can confirm whether all of the changes will be treats instead of tricks, I have to admit some of the changes looked mighty tasty. This week’s community SWTOR stream was held on Thursday, October 30th, 2014. The stream was the first of the next four streams dealing with Combat Changes heading to SWTOR when Update 3.0 goes live. There were many changes announced most of which dealt with combat in general as opposed to changes with a specific class/advance class. I have many of the changes listed, along with a short description. After reading through the list of changes I would advise going to the SWTOR Twitch stream to view the video of this stream, especially to see some of the UI changes mention during the stream. – Damage for everyone will be lowered back to the range as meant to be. Also there are several UI improvements coming in 3.0. They look great and will be a definite Quality of Life improvement. As I mentioned above, be sure to go the following link for this past week’s stream looking at Combat Changes coming to SWTOR. I would be very surprised if they wiped PvP comms as they are used from levels 10-55 (soon to be 60) on various items such as lockboxes, decorations, crystals, materials, pets, speeders, medpacs, adrenals, etc, and not solely on gear as the endgame pve comms are. In addition PvPers have to turn in armor shells to progress from the base tier to top tier gear, a restriction PvE does not currently have. I just verified and this is correct. Right now the plan is that Warzone and Ranked Commendations will remain untouched. What you have will stay with you into 3.0. As many of you have heard the commendations will be changing when Update 3.0 goes live. However nothing had been said about Wazone and Ranked commendations, until this post by Eric. As it states above, PVP commendations will remain unchanged when Update 3.0 goes live. Thanks Eric for finding out the answer to this question. I believe they said on stream that crystals aren’t changing. Don’t quote me on that, though. Oooo, I’m quoting you! Also, you are correct . +41 will remain on all color crystals in 3.0. There will be many changes when the Shadow of Revan expansion goes live, but new level of crystals is not one of the changes that need to be addressed. This was also confirmed on the live stream Thursday. Eric stated one of the reasons they were not making any changes to crystals is the fact that some people have purchased the +41 crystals via Cartel Market. While I agree with not making any changes to the crystals, I do not think because a crystal was purchased on the Cartel Market should be the reason though. If fairness to those consumers is the issue, why not offer an in-game deal that has players turn in their +41 crystals for a new higher level crystal at a reduced rate of what the new crystals are selling for on the Cartel Market. Another option might to have the stat for the crystals show up another place. This would mean the color crystal would just be a color, without any stats. 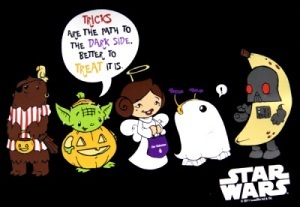 Just because it is Halloween that doesn’t mean your Star Wars fun has to be put on hold. 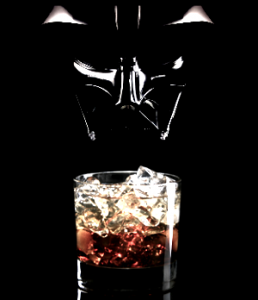 I have come across some ideas for treats, drinks, costumes and masks to help put the Force in your Halloween. 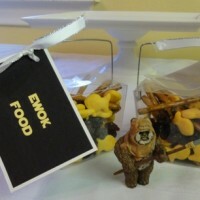 If you would like to add a few Star Wars treats to your party, I have found a few that are fairly simple to make and you shouldn’t have to travel tom a galaxy far, far, away to get them. 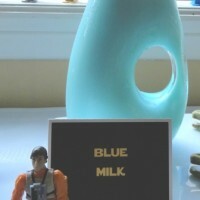 instructions: Stir in blue gel dye into milk until it is completely dissolved into the milk and serve this drink cold. One fairly easy Star Wars theme Halloween costume is Jedi/Sith robe. Of course you can spend a lot of money making the costume very realistic, but the costume site I found has fairly simple steps for creating the Jedi/Sith look in a costume and also an inexpensive lightsaber. 1.) Use the pants, turtleneck and boots as the base of the costume. Everything else goes on top of this. 2.) Remove the buttons from the adult-size shirt. Put this on the child over the turtleneck. Hem the sleeves so they drop at the wrists, and don’t cover the hands. Pull the two open front sides of the shirt towards the center so they overlap, forming a V at the neck. Buckle the belt on top of the white shirt to hold it in place and keep it from slipping. 3.) 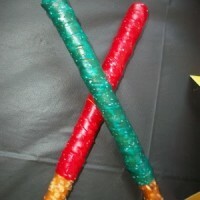 Make a light saber. Cut the blue or red eye piece out of the 3-D glasses, and tape it in place over the lens of the flashlight. Attach the white plastic tube over the end of the flashlight and tape in place. Cut a small circle of aluminum foil and tape it over the open end of the tube. To use as a light saber, simply turn on the flashlight. 4.) Finally, make a Padawan’s cloak. Drape the brown wool over the shoulders, and clasp it together with the pin. If you are really in a pinch for time and money or maybe you just need a little something as you hand out the treats to all those trick-or-treaters. Below are links to various Star Wars masks. All you need to do is select the mask you want, print it out and then cut it out. You can then add string to the mask and now it is ready to wear. Nothing says a costume or a mask has to cost a lot. Have fun and be safe! If you have a particular link, story, video, or topic related to SWTOR we would love to hear about it! You can send those to us here at Corellian Run Radio and we can place it in a future article. Just email us the links and/or the details for the event at corellianrun@gmail.com, or you can also leave any link suggestions in the comments below, or in Corellian Run Radio’s Facebook group. See you next week!